NATICK, Mass. (Jan. 26, 2015) -- The wide-reaching, overarching success of airbeam technology is music to Natick's ears. The technology has made its debut in a new incarnation as a part of a surprisingly luxurious rental tent used for a gala on the rooftop of Carnegie Hall. Airbeam technology consists of inflatable, high-pressure arches. The arches replace metal frames in tents and can be deployed rapidly. The airbeams come in small, lightweight packages. Large shelters and shelter complexes can be set up quickly and with fewer personnel than metal frames. The Natick Soldier Research, Development and Engineering Center, NSRDEC, along with its industry partners, has a long history of developing the very best shelters to protect the nation's Soldiers and their equipment. Many of the technologies developed by NSRDEC and industry for the military have directly and indirectly resulted in commercial applications. Todd Dalland, co-founder and president of Pvilion of Brooklyn, New York, designed the groundbreaking rental shelter for the Carnegie Hall rooftop event. 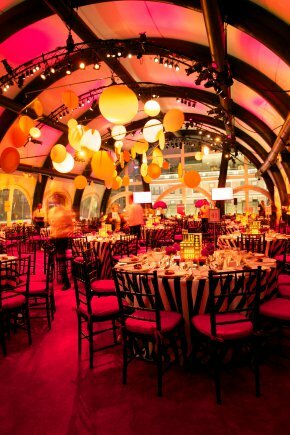 "The special event tent that Pvilion designed and produced for the rooftop of Carnegie Hall in midtown Manhattan uses airbeams developed by Federal-Fabrics-Fibers for its structural supports instead of aluminum frames," said Dalland. "This represents the first time that high-pressure airbeam technology has crossed over from military applications, associated with Natick, to commercial applications." "This was really an eye-opening demonstration of what this technology can do in the rental tent industry," said Jean Hampel, team leader of the Fabrics Structures Team, part of NSRDEC's Expeditionary Basing and Collective Protection Directorate, and a longtime expert in military airbeam shelters. "It shows the cost is coming down so it can be used in rental tents, and that's a really big commercial application." Pvilion designed, engineered and produced the shelter, which is the first practical and affordable rental tent using high-pressure airbeams. The company enlisted Federal Fabrics-Fibers to fabricate the airbeams and Anchor Industries to fabricate the fabric top. Stamford Tent installed the shelter at Carnegie Hall. "Since it's on a rooftop, you can't lay out many large pieces of framework," said Hampel. "Basically, with this, you just unroll it, inflate, and it stands up on its own. This was a very unique capability." Pvilion began working on various types of shelters with Natick in the late 1980s. Pvilion has collaborated with Natick in three areas, including General Purpose Tents, Flexible PV Fabric Tents, and Airbeam-Support Tents. Pvilion has been involved in the development of high-pressure airbeams for more than 20 years. "I think Natick may be the best new tent technology incubator in the world," said Dalland. "Natick has the best understanding of where military tents need to go in the future, and they are able to help support small, new tech companies with projects that move tents closer to Natick's vision." Federal-Fabrics-Fibers of Lowell, Massachusetts, has also been involved in key textile technology collaborations with NSRDEC, including the airbeams used in the Pvilion tent. NSRDEC, a pioneer in airbeam technology (and shelters in general), guides industry partners with its vast knowledge of military requirements and military textiles to oversee the technology development, the results of which have included airbeam-based military medical shelters, chem-bio protective shelters, aircraft shelters and expeditionary shelters. "It's safer than a metal frame tent in a storm," said Hampel. "If you're in a metal frame tent, you could have metal falling down on you or what's stored in the tent. With airbeams, they'll bend and pop back up. It's a big advantage." Natick has been improving and perfecting airbeam technology since the 1970s and began working with Federal-Fabrics-Fibers in the early 1990s. The late Zvi Horovitz established Federal-Fabrics-Fibers with his wife, Bracha Horovitz, in 1991, and NSRDEC's collaboration with Horovitz resulted in key innovations. Hampel said that the circular loom used by Horovitz was much better suited for inflatable fabrics than the usual flat loom and that Horovitz developed a computer-controlled device that could weave a curve into a tube. The innovation greatly advanced and improved airbeam technology, making airbeam shelters more durable, easier to set up, move and maintain. "As we were working with Zvi, we guided the research with our expertise in military textiles -- it must be flame resistant, abrasion resistant, etc.," said Hampel. "We added that knowledge to make sure we ended up with a product that would work in a military environment." NSRDEC and Federal-Fabrics-Fibers also overcame the big challenge of preventing air leaks through seams by creating seamless airbeams. Bracha Horovitz serves as president and CEO of Federal-Fabrics-Fibers and continues the company's dedication to serving the needs of both the military and commercial sector. "Zvi was an innovative guy who generated the idea, and Bracha has kept the technology alive and made many improvements," said Hampel. "We feel exceptionally fortunate to have a successful relationship with NSRDEC and are proud to make such an impact in the world of military shelters in creating an automatic-deploying tent that fulfills the needs of our warfighters on expeditionary operations," said David Retter, director of sales and marketing at Federal-Fabrics-Fibers. Hampel has seen impressive developments in airbeam technology over the years. One application, in particular, stands out most in her mind. "The Chemically and Biologically Protected Shelter, which incorporates Federal-Fabrics-Fibers airbeam technology, is the first type of medical facility that a Soldier would see in the field," Hampel said. "These shelters were used during the first Gulf War and saved lives as they provided an environmentally conditioned environment, which prevented shock and provided a capability for advanced medical care." The U.S. Army Natick Soldier Research, Development and Engineering Center is part of the U.S. Army Research, Development and Engineering Command, which has the mission to develop technology and engineering solutions for America's Soldiers.